Season’s Greetings and Best Wishes for 2014! https://affiliations.si.edu/wp-content/uploads/2019/03/si_Affiliations_rgb_single-line_color-280w-1.jpg 0 0 Elizabeth Bugbee https://affiliations.si.edu/wp-content/uploads/2019/03/si_Affiliations_rgb_single-line_color-280w-1.jpg Elizabeth Bugbee2013-12-18 10:17:132013-12-18 10:17:132013 Season's Greetings! In honor of the 150th anniversary of the Civil War, we created a Civil War 150 playlist on our Smithsonian Neighbor YouTube page. Check out these videos from our friends at the Senator John Heinz History Center (Pittsburgh, Pa.) and see if you spot the two artifacts on loan from the National Museum of American History! Do you have videos you’d like us to share on our YouTube page? Email Elizabeth Bugbee with the links and we’ll add you to our playlist! Recently, the Smithsonian unveiled the Smithsonian X 3D Collection and state-of-the-art 3D explorer. The Smithsonian X 3D Collection features objects from the Smithsonian that highlight different applications of 3D capture and printing, as well as digital delivery methods for 3D data in research, education and conservation. 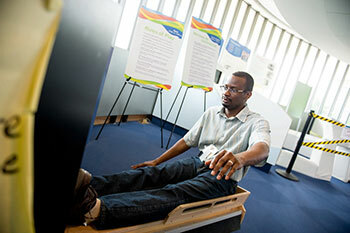 It was featured in a Center for the Future of Museums blog last week as well. Will it revolutionize the way we teach? Perhaps one day soon. But right now itâ€™s certainly transforming the way we see the world one amazing object at a time! I had a chance to explore the new 3D website and itâ€™s definitely worth registering for an account. Getting an up-close look at the Wright flyer or watching a video describing how the scans were completed is worth it alone, and then add on the â€˜toursâ€™ for each object and your creative wheels start turning thinking of how you can share this with everyone you know. All objects in the explorer come with comprehensive guided tours. Each tour tells an interesting story about an object of the Smithsonian X 3D Collection. Tours are similar to PowerPoint presentations, but are always “live”. At any time during a tour, you can interact with everything you see in the viewer. It was pretty easy to get a handle on and after clicking around for a while, I had it down and was zooming in and out to look at details in the Wright flyer. The coolest thing for Affiliates is the potential in the Educators section. In order to make our 137 million object collection more accessible, the 3D team came up with these teachable objects for everyone to explore. Some of our Affiliates are already using 3D technology for educational purposes. In fact, Dr. Herbert Maschner, Director of the Idaho Museum of Natural History, an Affiliate in Pocatello, Idaho, was a panelist in the recent symposium at the Smithsonian. He spoke about his museumâ€™s work in “democratizing science,” scanning collections all over the world, resulting in data sets which can be used by researchers in a variety of disciplines.Â The scans result in 3D or electronic files which can now be accessed from anywhere- even by teachers in classrooms, tying the subject matter into school curricula. So take some time and explore the new Smithsonian X 3D Collection.Â Just another idea from your friends at Smithsonian Affiliations to bring the Smithsonian to your neighborhood! Have you caught up on Smithsonian news in your neighborhood? Get a peek at several Smithsonian collaborations at the Japanese American National Museum in Los Angeles that are helping to tell the American story through the Japanese story. 2013 conference attendees participated in hands-on workshops at ImagiNATIONS education space in the National Museum of the American Indian. A record-breaking 119 attendees from 74 Affiliates attended the 2013 Affiliations National Conference. Check out some conference photos and see what your Affiliate colleagues said about the meeting. Guest author Amy Henderson, cultural historian at the National Portrait Gallery, shares her experience visiting Fort Worth Museum of Science and History while the Elvis at 21 exhibition was on display. Smithsonian EdLab workshops at four Affiliates demonstrated the power of going beyond the walls of the classroom to create a 21st-century idea of what education can be. Weâ€™re announcing a new fund to support the work of Smithsonian Affiliations in sharing resources with people in their own communities. Quick highlights from our four Affiliate staff members and one Affiliate intern during their residencies at the Smithsonian. 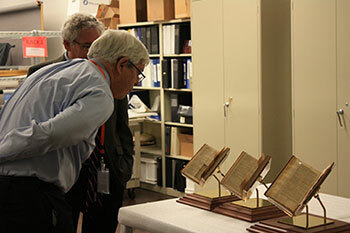 Ed Nichols, History Colorado director, and Harold Closter, Smithsonian Affiliations director view Jefferson’s Bible before it is displayed at History Colorado (Denver). 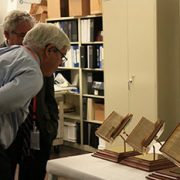 Five questions with History Colorado about the impact of bringing Thomas Jeffersonâ€™s Bible to the Denver community. A recap of events, exhibitions and programs in Affiliate neighborhoods from May to October 2013. 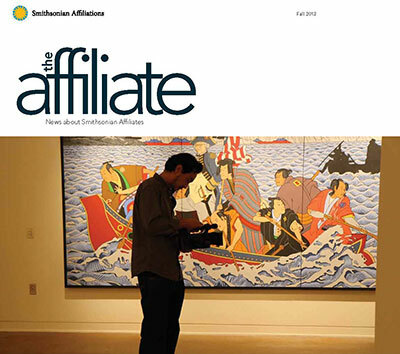 Visit our ISSUU library for past editions of The Affiliate Newsletter. https://affiliations.si.edu/wp-content/uploads/2013/11/histcolo.jpg 233 350 Elizabeth Bugbee https://affiliations.si.edu/wp-content/uploads/2019/03/si_Affiliations_rgb_single-line_color-280w-1.jpg Elizabeth Bugbee2013-11-26 10:00:162017-03-10 17:50:32Have you caught up on Smithsonian news in your neighborhood? The Lizzadro Museum of Lapidary Art in Elmhurt, Illinois, hosts Modern Designer Jewelry from the Smithsonian, an exhibition that features jewelry from American Jewelry designers from 1960 to 2009 from the collections of the National Museum of Natural History. Take an in-depth look at Pennsylvania’s significant role during the Civil War at the Senator John Heinz History Center in Pittsburgh. In its new major exhibition, Pennsylvania’s Civil War, you can find a tintype camera and portable printing press on loan from the National Museum of American History. Apollo Boilerplate Command Module on loan from the National Air and Space Museum. More than 21 artifacts on loan from the National Air and Space Museum are on view at the New Mexico Museum of Space History in Alamagordo. 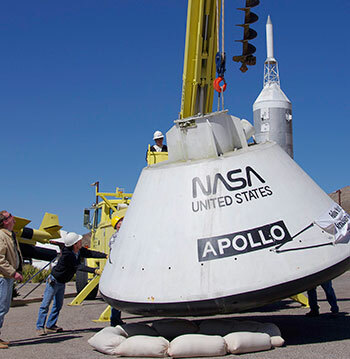 Get an up-close look at an Apollo Boilerplate Command Module and see the training coveralls worn by New Mexico astronaut, Harrison Schmitt, the only scientist to walk on the moon. If youâ€™re in San Antonio, the Institute of Texan Cultures is currently displaying two exhibitions from the National Museum of the American Indian and organized for travel by the Smithsonian Institution Traveling Exhibition Service (SITES). Native Words, Native Warriors tells the story of soldiers from more than a dozen tribes who used their Native languages while in service in the U.S. military. Ramp It Up: Skateboard Culture in Native America celebrates the vibrancy, creativity and history of American Indian skateboarding culture. It wouldnâ€™t be Thanksgiving without the rich tradition of gathering together at harvest time and celebrating the abundant joys of the season. At Plimoth Plantation in Plymouth, Massachusetts, visitors can learn all about the settlement of the Plymouth Colony in the 17th century. Go on safari at the Schiele Museum of Natural History in Gastonia, North Carolina. Fourteen specimensâ€”from a tiny eastern mole to a mountain gorillaâ€”are on loan from the National Museum of Natural History. 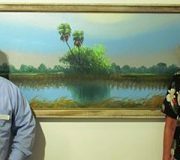 The Polk Museum of Art in Lakeland, Florida, includes five works of art from the National Air and Space Museum collection in its exhibition Paintings of the Space Age. Seminole Indian Summer Camp, ca. 1963, Earl Cunningham, oil on fiberboard, Smithsonian American Art Museum, Gift of Michael and Marilyn Mennello. Arizona State Museum, in Tucson, celebrates the creative work of American Indian directors, producers, writers, and actors during the Native Eyes Film Showcase, in collaboration with the National Museum of the American Indian and many others. If youâ€™re in California, visit the Japanese American National Museum in Los Angeles and see I Want the Wide American Earth: An Asian Pacific American Story. Created by the Smithsonian Asian Pacific American Center and organized for travel by SITES, the exhibit tells the story of how Asian Pacific Americans have shaped and been shaped by the course of our nation’s history. Check out the San Diego Air and Space Museum where you can see nearly 30 space-related artifacts on loan from the National Air and Space Museum. Is the Smithsonian in your neighborhood? Find an Affiliate here. Special thanks for this guest post to James “Zach” Zacharias, Senior Curator of Education and Curator of History at the Museum of Arts and Sciences Daytona Beach, Florida. 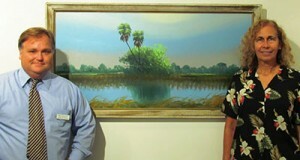 Zach Zacharias and Dr. Valerie Paul with “Highwaymen” on loan from fellow Affiliate, Orange County Regional History Center. Photo courtesy MOAS. Several years ago the Daytona Beach Museum of Arts and Sciences (MOAS) was looking for ways to increase attendance during the traditionally slow month of September.Â After a few brainstorming sessions, the curatorial and education departments came up with a brilliant idea to tie September MOAS with the Smithsonian Affiliations program.Â Access to the Smithsonian’s vast offerings is a perfect fit for MOAS’s educational goals.Â Â We wanted to try something radical and different- something that had never been done before. Â Thus came September with the Smithsonian. It proved to be all we had hoped for, and now is in its third year. This year we included Smithsonian Affiliates from around the state to lend their expertise to content. This year also marks the 500th Anniversary of the discovery of Florida by Juan Ponce de Leon.Â Florida has been celebrating with statewide initiative called Viva 500. Naturally, our theme for this yearâ€™s event focused on Florida’s history and natural history. The ideas revolve around having a Smithsonian related event every week during the month and on different days.Â The first key to success was to contact our Affiliate National Outreach Manager Alma Douglas and discuss our theme. With Almaâ€™s expertise, she was able to guide us to the resources and make contacts for our event. Our first week started out with Dr. Valerie Paul, Director of the Smithsonian Marine Station at Fort Pierce.Â Her presentation, Exploring Floridaâ€™s Marine Environment, focused on the mission of the Smithsonianâ€™s center and how it relates to Floridaâ€™s all-important ecosystems.Â Dr. Paul highlighted the cutting edge research that the Smithsonian is conducting for medical research and the important issues in Floridaâ€™s fragile coral reef ecosystems. Our second week, Chuck Meide, Underwater Archaeologist from St. Augustine Lighthouse and Museum, a fellow Smithsonian Affiliate, gave a presentation on the underwater archaeological excavation of a colonial era shipwreck.Â It sank off the entrance of St. Augustine Inlet during the British loyalist evacuation of Charleston in 1782. 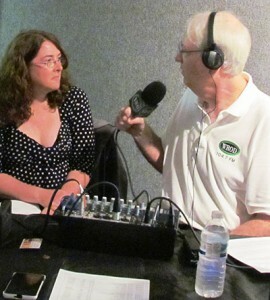 Dr. Kathleen Lyons in an interview with WROD’s Cadillac Jack at the MOAS Natural History Festival. Photo courtesy MOAS. September with the Smithsonian heated up in the third week of the month with our annual weekend event MOAS Natural History Festival.Â It focused on the natural history of Florida and featured huge displays of fossils, shells, minerals and other specimens.Â Community partners such as the local Audubon Society, local fossil club, and many other organizations made this community event a hit with families. Dr. Kathleen Lyons from the Department of Paleobiology at the National Museum of Natural History presented two lectures focusing on the legacy of the giant ice age animals that once dominated Florida landscape from Giant Ground Sloths to Mastodons. Our month long series culminated with free admission during Smithsonian magazine Museum Day Live! and two performances by the Smithsonian Jazz Masterworks Orchestra.Â It is the orchestra-inâ€“residence at the National Museum of American History. Â For the third year in a row, this world-class jazz band has traveled to Daytona Beach to play for sold-out crowds.Â This year, the theme was Swinging with the Smithsonian featuring the Ella Fitzgerald Song Book. 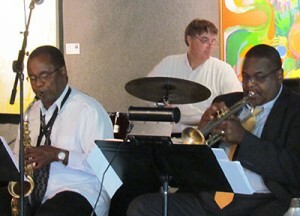 Members of the Smithsonian Jazz Masterworks Orchestra. Photo courtesy MOAS. The Jazz Masterworks Orchestra conducted a matinee jazz show for kids called Swinginâ€™ with the Smithsonian Junior. Â Young musicians from the community flocked to the performance to hear this great educational event. The musicians demonstrated their instruments, discussed the concept of jazz music, and focused the importance of playing an instrument no matter what age or level you are at. The featured evening event was under the executive direction of Kennith Kimery and artistic director and principal saxophonist Charlie Young.Â Â With special guest vocalist Lena Seikaly, it showcased the music of legendary songstress Ella Fitzgerald. The audience was treated to some of Ellaâ€™s best and most famous works. The Museum of Arts and Sciences, Daytona Beach Florida has developed a long-standing relationship with the Smithsonian Affiliations program to bring resources to our community that would normally be out of reach.Â The ability to bring in scholars, programs, and artifacts has allowed the MOAS to enrich our members and community and inspire lifelong learning.